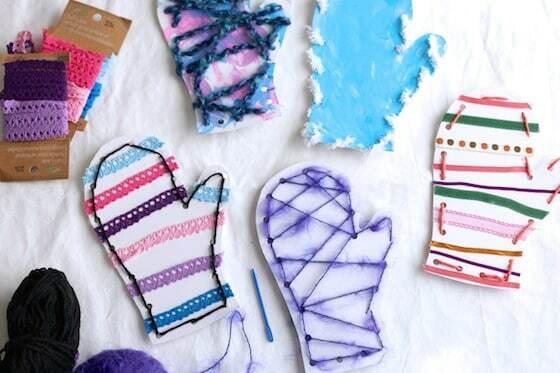 These HOMEMADE MITTEN LACING CARDS make a great activity for a preschool winter theme. 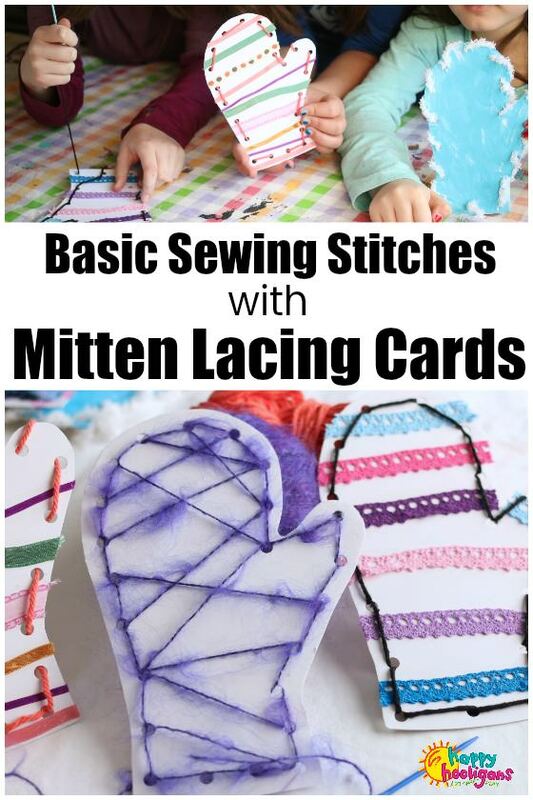 Lacing is a fun way for toddlers and preschoolers to learn early sewing skills, older kids can use these lacing cards to practice basic sewing stitches. My toddlers and preschoolers have always loved lacing activities, so I often make homemade lacing cards to go along with whatever theme or season we’re celebrating. These mitten lacing cards are perfect for this time of year. Toddlers and preschoolers can use them to develop their fine motor skills, and they’re a great tool for teaching older kids how to make specific sewing stitches. 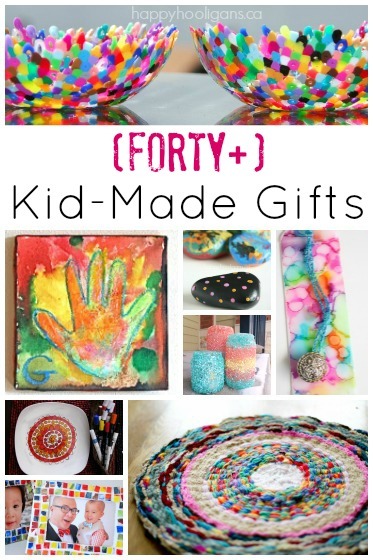 I have a crew of older kids who come over to craft on PD Days and Saturdays. They range in age from 7-12. These kids have shown a keen interest in learning how to sew by hand lately, and they regularly go through my fabric bin, choosing scraps of fabric to sew together by hand with a needle and thread. So far, their projects have been very basic. They like to just secure two pieces of fabric together to make small pouches and whatnot, but they just do it willy-nilly. They haven’t learned how to make any specific types of stitches. The other day I got to thinking that I should teach them some of the basic sewing stitches, and I thought that lacing cards would be a great way to do it. Being that we’re in the throes of winter here, I prepared these mitten lacing cards for the kids, and had them decorate them before we got down to sewing with them. They worked so well as a teaching tool! Because they’re so sturdy, the lacing cards were easy for the kids to handle, and the holes were prepunched for them, so it was easy to instruct them where to insert their needles as they were making their stitches. It was also really easy for them to pull the yarn out and re-do their stitches if they made a mistake. Much easier than if they’d been learning with fabric. The stitches they worked on were: backstitch, running stitch, overstitch and blanket stitch. They loved this activity, and they were able to really grasp the mechanics of making these basic stitches. Now they’ll be able to apply what they learned the next time we pull out the fabric scraps. 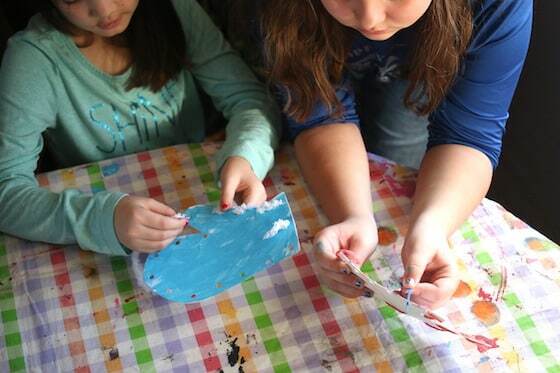 To see how we made our lacing cards and how the kids used them, pop on over to CBC Parents!